When building our cars we often run into an issue with over complicating certain aspects of the build. The plumbing of fluid systems such as fuel and coolant is one such area. Various types, sizes, and styles of hoses, connections, clamps and fittings can sometimes make installing, servicing, or repairing our cars more of a headache than the enjoyable hobby we prefer to think of it as. Jiffy-Tite is a company that’s helping many of us in both the street and racing world change all of that. “At Jiffy-Tite we’re trying to help you simplify your cars plumbing,” says Duane LaFleur of Jiffy-Tite. 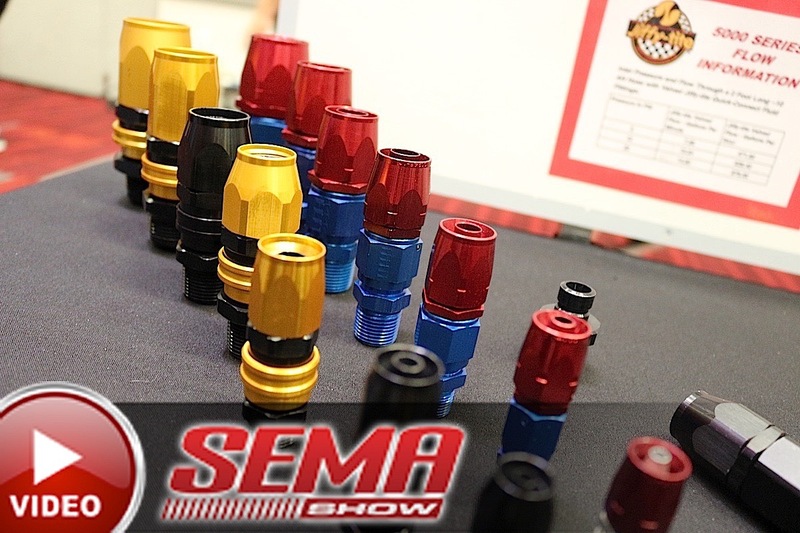 The company’s revolutionary quick disconnect fittings are helping racers and street enthusiasts alike to simplify nearly every fluid system on their cars. For this article we’ll be focusing on two systems where most of our cars could benefit from a quick connect fitting, the carburetor and the cooling system. Jiffy-Tite’s quick-connect fittings are available to work with nearly every fluid on your vehicle with the exception of brake lines as brake line pressure exceeds the maximum operating pressure of a Jiffy-Tite fitting. The sliding collar quick-connect design eliminates the need for tools when connecting or disconnecting fittings such as at the carburetor. These can be ordered with or without internal valving that allows fluid to flow bi-directionally when connected but eliminates leaks when disconnected. The valving design has minimal effect on actual fluid volume or flow potential as well. There are various sizes for virtually any hose size and they are designed to work with most steel-braided and push-to-lock systems, with the exception of those that incorporate Teflon. They can operate at a maximum pressure of 200psi and have a maximum operating temperate of 350° F.
Their quick-connect fittings can replace nearly any fitting in any location. In theory you could make every connection on virtually all of your fluid systems a quick-connect if so desired. Transmission fluid, coolant, engine oil, carburetor or fuel injected connections, fuel pumps and rails can all be outfitted with Jiffy-Tite fittings. The quick-connect design utilizes stainless ball bearings and brass valves, and is similar in principle to the quick connection used on air tools. To operate a quick-connect fitting simply slide back the collar of the plug end and slide it onto the socket end. “When you hear a click, you know you’ve got a tight connection,” says LaFleur. Disconnecting the line is just as simple. 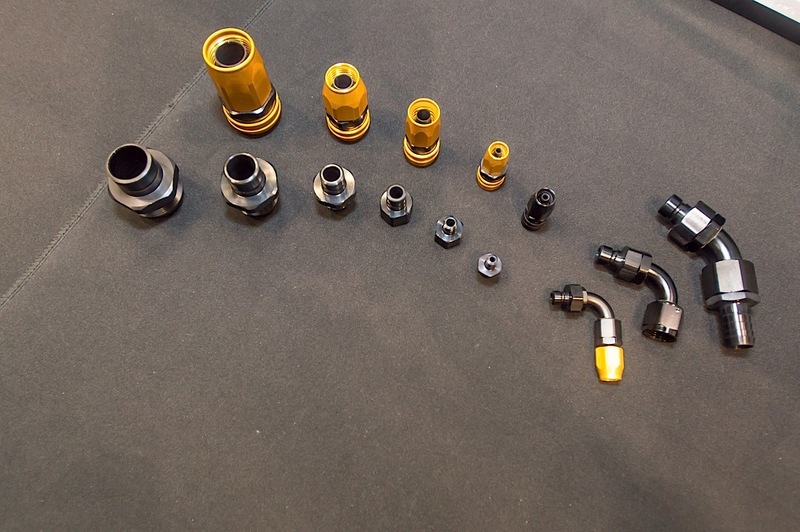 Fittings are available with and without valves, a valved fitting will not leak when disconnected, this further increases safety as well as reduces mess when servicing any system on your car that has been equipped with them. Left: We assembled this fuel supply rail using -8AN line as well as Jiffy-Tite quick-connect sockets, part#: 31308 also in -8AN size. We included a fuel pressure gauge as well. Center and Right: If you've ever installed or replaced a carburetor chances are pretty good you had to install the fuel fittings to the bowls. Installing the Jiffy-Tite carb fittings was a simple matter of replacing our old threaded fittings with the new quick-connect sockets, part #: 320CI.These sockets are for carburetors that accept 7/8 fittings and accept a -8AN supply line. Once you install that fitting you’ll never need to use tools on it again. In many cases it’s easier to service a carburetor off of a car than on it which is one of the advantages to using the Jiffy-Tite quick-connect fittings for your carb connections. Sometimes something as simple as changing jets can become a frustrating affair on the car with dropped parts, fuel spillage, and limited space to work. Then there’s working at awkward angles, sometimes while laying over a hot engine and if said car has an expensive or fresh paint job, you risk damaging it or denting the body by laying against it or spilling fuel on the paint. As we began to assemble our fittings, we noticed another obvious advantage to the locking collar design – it dramatically spruced up our under-hood appearance right out of the packaging. Paired with our Hose Candy hose skins, our engine bay was ready for a huge transformation. The Jiffy-Tite fittings are available with an anodized black or gold finish. In the past, no matter what type of tools you’re using, if you had to service parts equipped with typical threaded anodized fittings on a regular basis you will eventually scratch and mar the fitting’s finish. Left: We installed our fuel rail on the carburetor using the quick-connect fittings. Right: The fuel supply line from our fuel pump was also outfitted with Jiffy-Tite plug with a socket part number 31308, also -8AN. A plug with a 45 degree elbow to allow for proper routing, part# 32608D went on the end of the hose that meets the pump. Obviously this comes with the territory of using such fittings, but when dealing with a car that is shown regularly, or if you’re just a stickler for the overall appearance of things, this can become frustrating. Fittings aren’t cheap, and replacing them because of appearance can be time consuming and costly. The Jiffy-Tite quick-connects greatly reduce the chances you’ll have this issue ever again. “Once you install that fitting you’ll never need to use tools on it again” explains LaFleur. With threaded fittings you also run the risk of stripping threads, rounding the hex, and possibly over or under tightening. All of these things can add up to a fluid related accident, such as a possible breakdown or worst case scenario even a fire or crash caused by spilled, leaking, slippery, or flammable liquids. Replacing typical NPT or AN fittings in any fluid system with valved quick-connects has a number of advantages. Minimal fluid loss when disconnecting a line. No risk of stripping or damaging a fitting. Fast, simple and easy disconnect and reconnect. No uncertainty of whether a fitting is tight enough of fully disconnected. Reduced risk of breakdown or under hood fire due to an improperly connected fitting. Before ordering you need to know a few things including the line size and type of line you’ll be using. You don’t need to worry about stepping up your line size because of any restriction caused by the quick-connect system or it’s valving. The fittings cause minimal flow restriction, as LaFleur points out “We’ve got professional racers running our product and they don’t see any difference in horsepower on they dyno or at the track.” Further assurance of this can be found in the Jiffy-Tite catalog which provides specific flow data for the company’s fittings. You’ll also need to know in the case of carbureted applications the information regarding your fittings at the carburetor. This is not the time to call Jiffy-Tite and spout off a brand and model number carburetor. You should have, or be able to obtain from the carburetor manufacturer the specifications of size and thread pitch for the fittings that go into the bowls of the carburetor. You will need those specs when you order your fittings from a Jiffy-Tite supplier. You’ll also need to specify your fuel type (gasoline, alcohol or nitro) as this affects the types of seals used in the fittings you order. We installed a 90-degree brass fitting in the intake manifold coolant port along with a Jiffy-Tite -8AN non valved socket, part number: 31608AD. We then fabricated this hose using Jiffy-Tite -8AN quick connect plug, part number 32308A and some Hose Candy silicone clamps to keep things tidy. If you’ve ever installed a carburetor you can do this job. Having worked with braided hose and fittings in the past will also be helpful in speeding things along, but is not mandatory in getting the job done properly. Also, you should be aware that the bodies of the Jiffy-Tite fittings are slightly larger than your typical AN fitting. As such, you’ll need to allow a bit more clearance, so if there are areas of tight clearance you should map things out and plan accordingly before beginning the installation. We began by constructing a fuel supply rail with -8AN braided line and attaching two quick-connect plugs (part #32308) to the ends of the rail that will attach to our carburetor. We also installed a fuel pressure gauge so we can monitor pump operation appropriately. At our engine mounted fuel pump we installed quick-connect fittings for our fuel supply to the fuel rail as well. We used a valved socket at the pump (part #31308). The line that goes to the fuel rail utilizes a quick-connect that featured a 45° elbow to route the supply line around engine mounted accessories appropriately (part #32608D). All of the fittings used were for -8AN line. Jiffy-Tite carburetor fittings then replaced the standard threaded fittings that go into both bowls on the carburetor itself. To do this we removed the old threaded fittings and replaced them with Jiffy-Tite carburetor sockets (part #320CI). These are for 7/8-inch carburetor fittings, for use with -8AN line, the sockets feature the valving system to prevent leaks and also have the standard flurocarbon seals for use with gasoline. This fuel system conversion allows us to service all or part of the fuel system as needed, at any given time. For example if we simply need to replace the pump or fuel pressure gauge due to a failure, we can minimize the mess, further our carburetor bowls won’t be gravity draining due to the disconnected line. Left: you can see the fittings mocked up to check for interference with the fuel rail prior to our actually constructing the coolant hose. Right: Here's the coolant hose installed with the fittings and fuel rail in place. We also used Jiffy-Tite quick connect fittings on the coolant passage at the front of the intake manifold. We also used -8AN line and fittings for this portion of the installation. We installed a 90-degree brass fitting in the intake, then a Jiffy-Tite socket part number 31608AD. Notice the amount of room needed for the fittings in the pictures. We can’t stress enough the importance of pre-fitting everything prior to installation. We constructed a new coolant hose using -8AN braided line, followed by a Jiffy-Tite plug on the end of our braided line, part number 32308A. We used a couple of Hose Candy silicone clamps to keep the new coolant hose tidy as well as leak proof at the connection and to maximize space in this tight area. Once the hose was constructed we tested it for proper fitment and installed it in place. 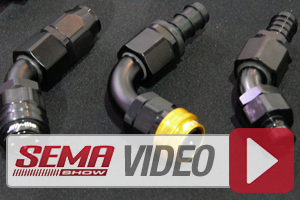 This now allows us to break this connection quickly and easily, and also can speed servicing or repairing any of the components the quick-connect fittings are attached to. Once all of the fittings and hoses were connected we filled the cooling system and fired up the car to check for leaks due to improper installation. With no leaks verified this car is once again ready to hit the streets. We’ve highlighted our installation with the included pictures of the process and the end result is not only effective but good looking as well, and should make servicing the car at home or elsewhere that much easier as well as safer. The engine bay is cleaned up and servicing will now be easier. It was a straight-forward install that any basic car customizer should be able to handle.